Dr. Margot Burnell, Horizon’s chief of staff for the Saint John region, said incidents of misdosing could go back as far as 2011, but maintains it’s “highly unlikely” that receiving 10 per cent less chemo would’ve shortened a patients lifespan. 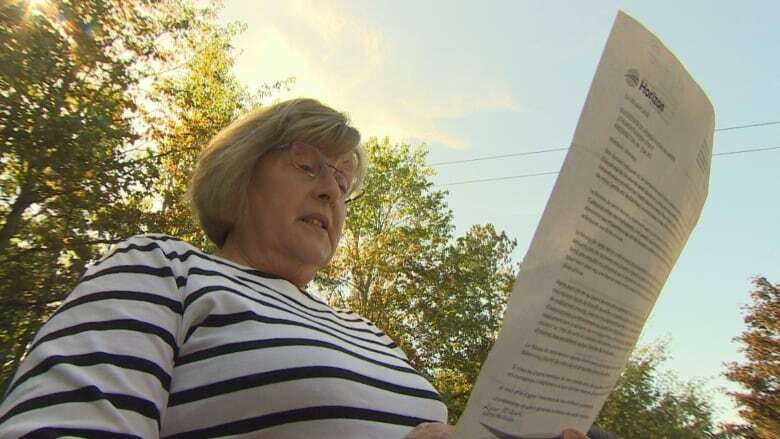 When Glenda Hardie, whose husband died of cancer in 2016, received a letter from Horizon Health on Thursday stating he may have received less than the prescribed amount of chemo, she was left with a multitude of unanswered questions. "What do I do with this information, like why are they sending this letter?" said Hardie. "Ten per cent of medication. Which medication? If he had received all of the medication, would it have made any difference at all?" Horizon Health answered some questions Friday about what they knew, and when. Dr. Margot Burnell, Horizon's chief of staff for the Saint John region, said incidents of misdosing could go back as far as 2011, but maintained it's "highly unlikely" that receiving 10 per cent less chemo than prescribed would have shortened a patient's lifespan. "These drugs do have some leeway in the amount that's given in how they affect their target," said Burnell. "There is a variance within how people metabolize it with how the tumors react to it. And so it was felt that within that variance it was not going to change how patients tumors overall responded to the drugs." 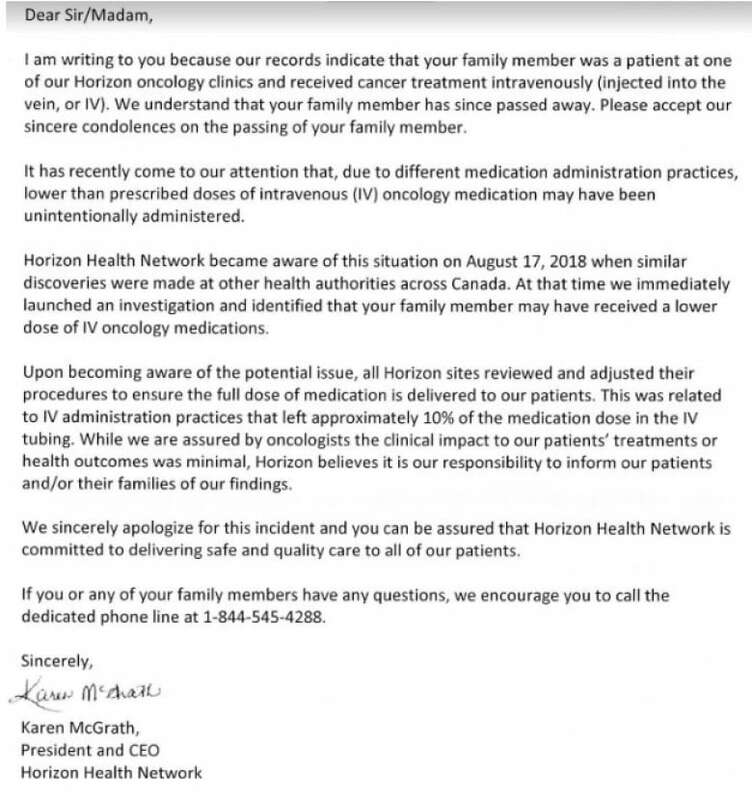 Jackie Manthorne, the president of the Canadian Cancer Survivor Network, says Horizon Health has handled this situation 'very badly.' (CBC)​Burnell said the health authority found out about the mistake in mid-August and worked quickly to inform patients, or family of deceased patients, about the errors. 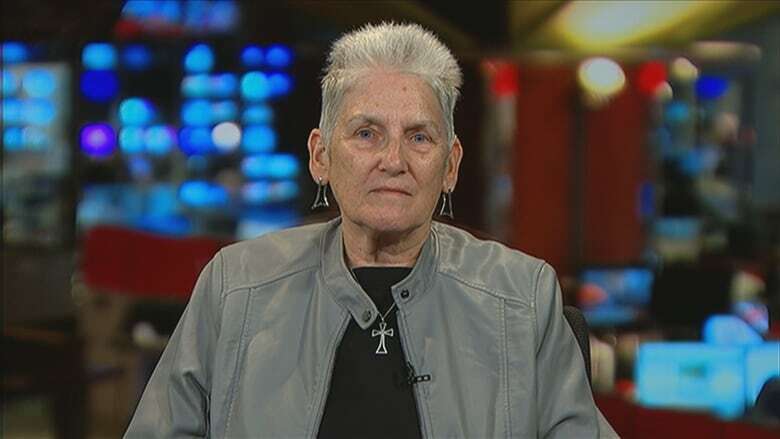 But Jackie Manthorne, president of the Canadian Cancer Survivor Network, isn't impressed with the way Horizon has handled the situation. "I think it's been handled very badly," said Manthorne. "As a patient it's devastating to find out that your chemo drugs were not what they should be. And what's even more devastating about it is that we don't know what impact that could have on whether the cancer comes back, how long you might remain in remission, whether your cancer will advance or whether some of the people who have died since those chemo drugs were given may have lived longer." A copy of a letter sent to the family of a deceased cancer patient informing them their loved one may not have received a complete dosage of chemo. (Submitted)​Burnell said of the 248 patients who were affected by the chemo error, 120 are dead. She also said she doesn't know of any patients who have had to alter their treatment because of the error. Manthorne says she doesn't think Burnell's answer of it being "highly unlikely" that the error shortened life spans is a good enough answer. "That wouldn't reassure me," said Manthorne. "I think there's enough distrust now in our healthcare system that people feel they need more answers. And frankly they deserve more answers." Manthorne said she thinks there should be better oversight of the way chemo drugs are administered so mistakes can be quickly dealt with. "Nobody's perfect but … when problems are identified I think there has to be real transparency and not just saying, 'Well this happened and you're still ok,'" she said.